With how many times Donald Trump has said controversial things about illegal immigrants, it only makes sense that those offended have voiced their displeasure with him for the past few months. 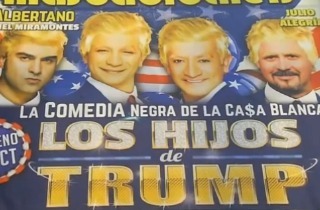 As it turns out, one of the newest ways the people of Mexico are shrugging off Trump’s comments is through humor, specifically Los Hijos de Trump (Sons of Trump). “As we say here, if you dish it out, you’ve got to be able to take it,” actor Freddy Ortega told Reuters. He went on to explain how the show connects to the lampooning he’s done of Mexican politicians, and that it was helpful to those alarmed by Trump’s rise. Set designer Sergio Villegas said the idea came from an intended revival of a Mexican play lampooning the reckless excess of global financiers, but it was re-envisioned to focus on Trump. The show is booked to run for six weeks, but its producers are hoping to bring it to the United States.